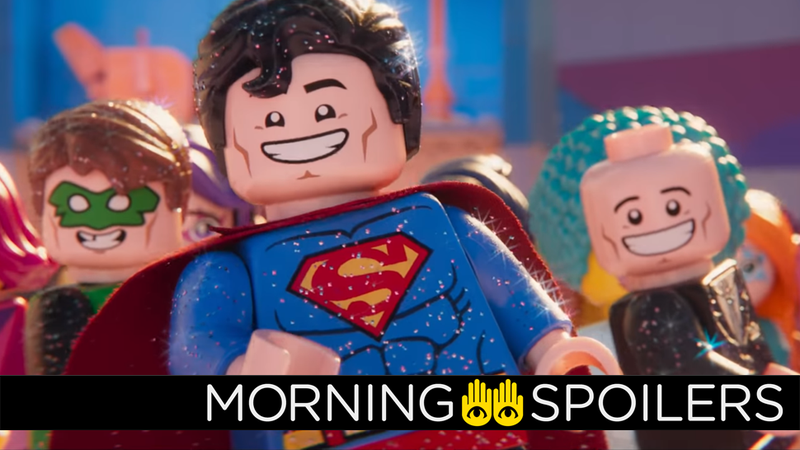 The Lego Movie 2 will have plenty of familiar DC heroes—but a few will be voiced by their cinematic counterparts. The Teenage Mutant Ninja Turtles are getting a movie reboot (again). There’s more rumors about who could be the villains of The Batman and Detective Pikachu. Get a look at Men In Black: International’s intergalactic agents. Plus, new Supergirl pictures, and what’s to come from the Roswell reboot. Spoilers away! Flickering Myth has confirmed Gal Gadot, Margot Robbie, and Jason Momoa will reprise their roles as Wonder Woman, Harley Quinn, and Aquaman, respectively, in the medium of Lego minifigures. But don’t get your hopes up about that—because Rothman later clarified that he’d been making a joke. We Got This Covered alleges The Penguin will indeed be “one of the main antagonists” in Matt Reeves’ The Batman. Meanwhile, GeeksWorldWide “has been informed by multiple reliable sources” that Booster Gold will have “small role” in the upcoming Blue Beetle movie. Entertainment Weekly has three new photos showcasing the film’s alien MiB agents, including a character encrusted with dripping, fungal growths, and a pair possibly inspired by the fourth season of animated series. Director David F. Sandberg shared one of the film’s tie-in action figures on Instagram. Coming Soon has a new international poster. Taraji P. Henson can hear men’s thoughts in a new clip from the semi-sequel to 2000's What Women Want. The Wrap reports Lucinda Dryzek, Jefferson White, and Jonathan Whiteshell will co-star in the recently announced episode starring DeWanda Wise and Jessica Williams. We’ve got a fresh roundup of all the info we know on the upcoming show here by the way! According to Deadline, Robert Kirkman’s production company Skybound Entertainment is now developing a TV series based on the 2017 South Korean assassin film, The Villainess. Watch the original film’s trailer, here. Amazon Studios is also developing a television series titled Thirteen, based (confusingly) on Mike Oeming and Dan Berman’s Image Comics graphic novel, Six. According to Deadline, the series concerns “a cold-blooded alien agent who comes to Earth to track down and bring back 12 alien defectors. As a result of her actions, she starts to experience the same thing that infected the others – human emotion.” Stefan Jaworski is attached to write the pilot, with Michael Dinner (Justified), set to direct. TV Line has photos from Supergirl’s January 27 episode, “Blood Memory.” More at the link. Michael Trevino and Tyler Blackburn discuss their characters in two new featurettes from the CW. Finally, enjoy a set tour of Syfy’s Deadly Class hosted by Luke Tennie.